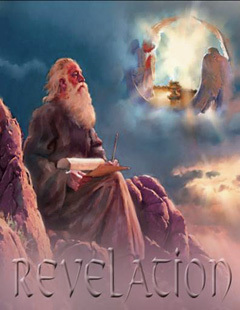 The Book of Revelation, also called Revelation to John, Apocalypse of John, from Greek Αποκαλυψις Ιωαννου, Apokalupsis Iōannou, and Revelation of Jesus Christ is the last canonical book of the New Testament in the Bible. It is the only biblical book that is wholly composed of apocalyptic literature. The book is frequently called "Revelation"; however, the title found on some of the earliest manuscripts is "The Apocalypse of John" (Αποκάλυψις Ιωάννου), and the most common title found on later manuscripts is "The Apocalypse of the theologian" (ΑΠΟΚΑΛΥΨΙΣ ΤΟΥ ΘΕΟΛΟΓΟΥ). (In English, apocalypse is often rendered as revelation and the literal meaning of the Greek word is "unveiling".) After a short introduction (ch. 1:1–10), the book presents a brief account of the author. The first vision (1:11–3:22), related by "one like unto the Son of man, clothed with a garment down to the foot, and girt about the paps with a golden girdle", speaking with "a great voice, as of a trumpet", is a statement addressed to the seven churches of Asia. The second vision, which makes up the rest of the book (chs. 4–22), begins with "a door … opened in the sky" and describes what some might call the end of the world— or more properly, the end of the age, in which Satan's rule through Man is destroyed by the Messiah. These events are foreseen: the Great Tribulation, the Campaign of Armageddon, the Second Coming of the Messiah with the restoration of peace to the world and His 1,000 year reign, the imprisonment of Satan until he is 'loosed' for the final rebellion, God's final judgment over Satan, the Great White throne judgment, and the ushering in of the New Heavens and New Earth. Alternatively, according to the Preterist theory, the events of the latter part of the Apocalypse of John are interpreted as being fulfilled by events in the 1st century. because of the Montanists' heavy reliance on it. In the 9th century, it was included with the Apocalypse of Peter among "disputed" books in the Stichometry of St. Nicephorus, Patriarch of Constantinople. In the end it was included in the accepted canon, although it remains the only book of the New Testament that is not read within the Divine Liturgy of the Eastern Orthodox Church. See Biblical canon for details. of a single common author point to similarities between the Gospel and Revelation. For example, both works are soteriological (e.g., referring to Jesus as a lamb) and possess a high Christology, stressing Jesus' divine side as opposed to the human side stressed by the Synoptic Gospels. In the Gospel of John and in Revelation, Jesus is referred to as "the Word of God" (Ὃ λόγος τοῦ Θεοῦ). Explanations of the differences between John's work by proponents of the single-author view include factoring in underlying motifs and purposes, authorial target audience, the author's collaboration with or utilization of different scribes and the advanced age of John the Apostle when he wrote Revelation. A natural reading of the text would reveal that John is writing literally as he sees the vision (Rev 1:11; 10:4; 14:3; 19:9; 21:5) and that he is warned by an angel not to alter the text through a subsequent edit (Rev 22:18-19), in order to maintain the textual integrity of the book. canons, especially in the Eastern Church, rejected the book, while most others included it. Eusebius had started the persecution referred to in the book; however, recent scholars dispute that the book is situated in a time of ongoing persecution and have also doubted the reality of a large-scale Domitian persecution. Some exegetes (Paul Touilleux, Albert Gelin, André Feuillet) distinguish two dates: publication (under Domitian) and date of the visions (under Vespasian). Various editors would have a hand in the formation of the document, according to these theories. The dating of the work is still widely debated in the scholarly community.